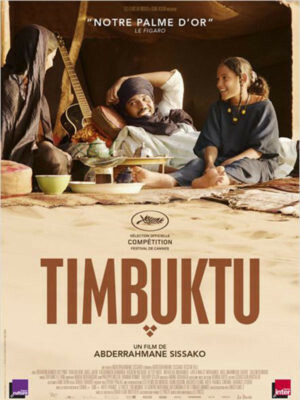 Not far from the ancient Malian city of Timbuktu, now ruled by the religious fundamentalists, proud cattle herder Kidane (Ibrahim Ahmed aka Pino) lives peacefully in the dunes with his wife Satima (Toulou Kiki), his daughter Toya (Layla Walet Mohamed), and Issan (Mehdi Ag Mohamed), their twelve-year-old shepherd. In town, the people suffer, powerless, from the regime of terror imposed by the Jihadists determined to control their faith. Music, laughter, cigarettes, even soccer have been banned. The women have become shadows but resist with dignity. Every day, the new improvised courts issue tragic and absurd sentences. Kidane and his family are being spared the chaos that prevails in Timbuktu. But their destiny changes abruptly in this stunningly rendered film from a master of world cinema.